What do we do when we receive blessings? We celebrate, right? On birthdays, graduations, promotions, and the like occasions, we would really make time and effort to celebrate even in little ways to show appreciation for the blessings we receive. It is also a way for us to share these blessings with our family, friends, and other people we love. Having a newborn baby is also a blessing that would-be parents would celebrate the coming of their baby and call it a “baby shower.” The objective of a baby shower is that it would “shower” a mother-to-be with gifts that her child would soon use as well as parenting and child-rearing pieces of advice from “veteran” mothers. Before the church would usually host baby showers but times have changed now since baby showers can be done by just anyone—including the mother herself, although it is encouraged that she would be helped by her loved ones so that she would feel supported in the critical weeks of her pregnancy. However, there is also a perception that if it’s the family, especially the parents of the baby would be the ones who are going to hold the party, it would seem like they are begging for gifts. That is why the friends of the would-be parents would be the ones who would be hosting baby showers. This is when checklists templates would come into play since not all friends are experienced event planners. But despite these perceptions, there are some would-be parents who would like to be hands-on and involved with the planning and preparation stage because after all, the celebration is made possible by their baby. 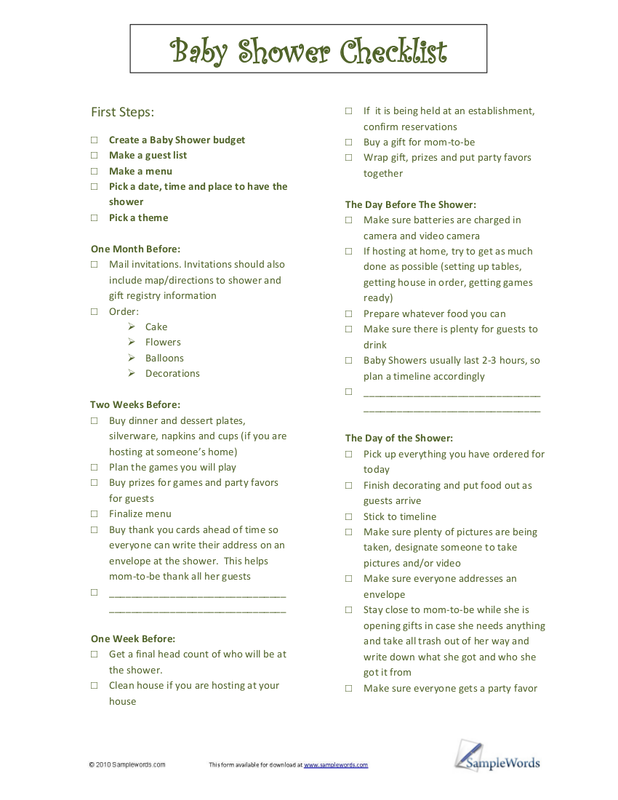 Checklists have proven to be helpful in our day-to-day lives as well as life’s celebrations. There are camping checklists for the adventure and leisure seekers, there are wedding checklists and even a bride’s checklist to top that for marriage celebrations, as well as checklists for students, a checklist for new employees as well as a marketing checklist for small businesses. If there are checklists for those events and activities, why can’t baby showers have one? After all, even if it’s not being held by the majority, it is still a celebration that checklists would be of great use especially in the planning and preparation stages. Planning and preparation for any event can be stressful and overwhelming. Whats more stressful is when you are not allowed to get stressed at all. Take for example expectant parents who are about to give birth; they want for their firstborn child to be grandiose thus, they would hold baby showers. It may seem fun at first in the what-ifs period but when the actual planning and preparation would commence, it would sometimes cause stress and a lot of fuss and we all know that mothers should not get stressed at all or else the baby will be put to harm. Luckily, there are a lot of ways to make baby showers less stressful and make things fun and enjoyable as baby showers are intended to do so. 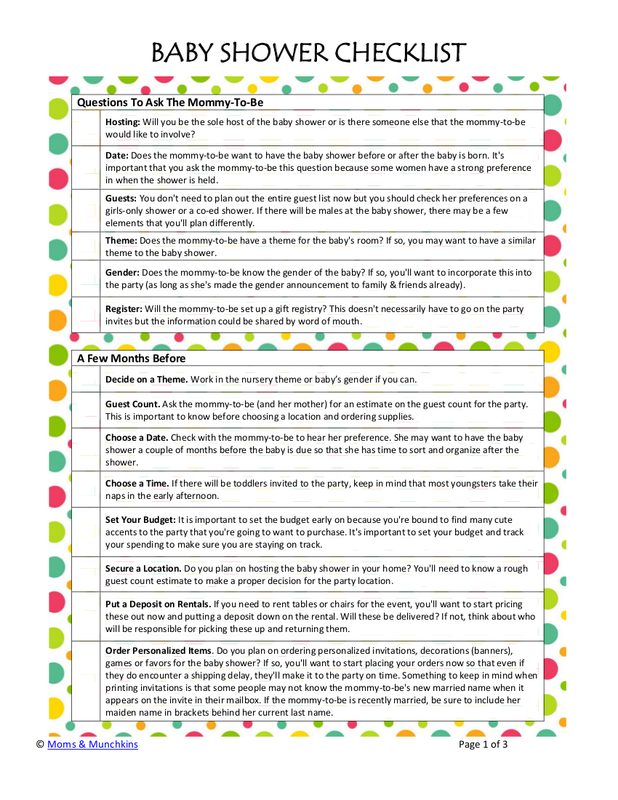 One of the ways to make a baby shower memorable is through checklists. It may seem way out of the line and the connection with the success of any event planning and the making of checklists might sound off but checklists really do have a positive impact on every event planning. 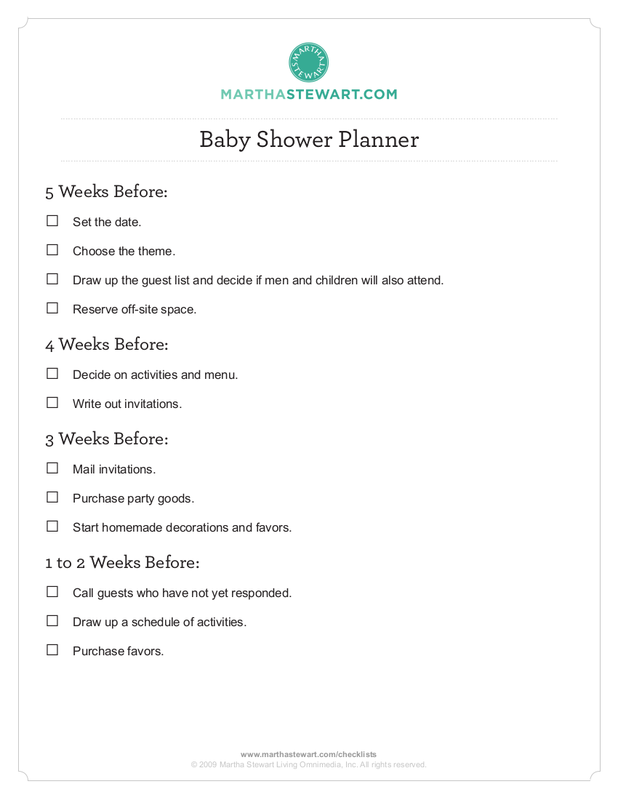 Why Use a Baby Shower Checklist? Every organized and orderly event out there can never be successful without the use of a tool that would make every planning and preparation stage organized and orderly. 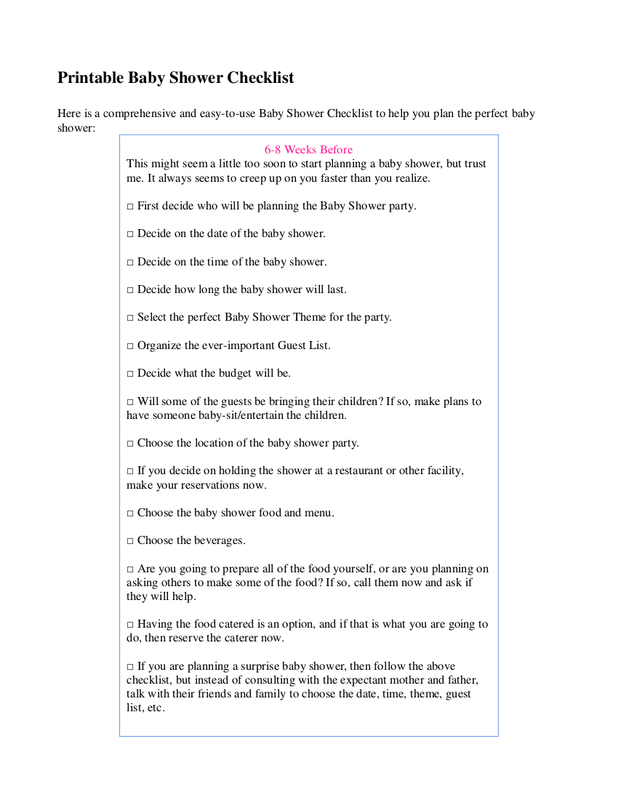 Even though there are some people who would find making checklists for an event unnecessary, it won’t harm if you would use a checklist that will serve as your guideline in planning and preparation for a baby shower. A baby shower checklist decreased the amount of stress it might shower on you. Every event planning is undeniably stressful. There is just so much to think about and it’s not only the decorations and the food; it also includes the people that will be invited to the event. Durin the event preparation, it could be possible that everything will be all around the place and extremely disorganized. 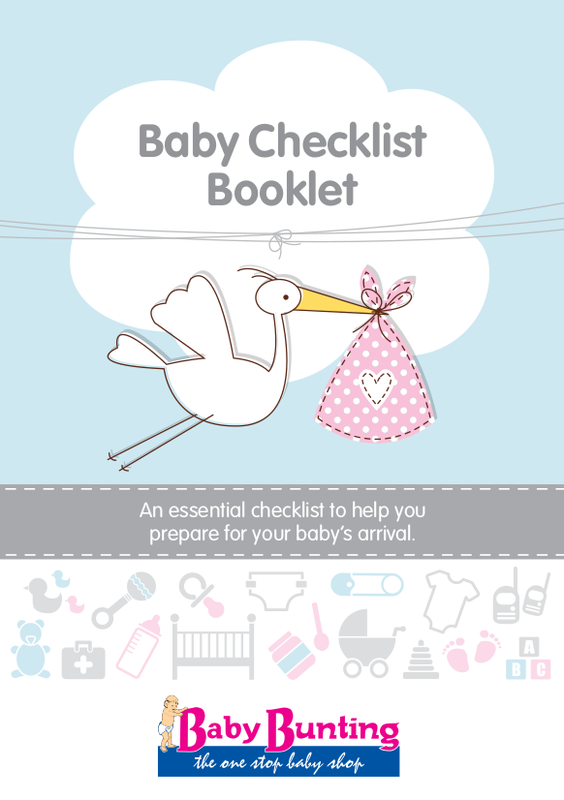 However, with the use of a checklist during every baby shower preparations, everything will be so much better. Everything will be organized in a step-by-step process that will make the event planners, and even the would-be parents, will be able to have a visual cue on how things will turn out. 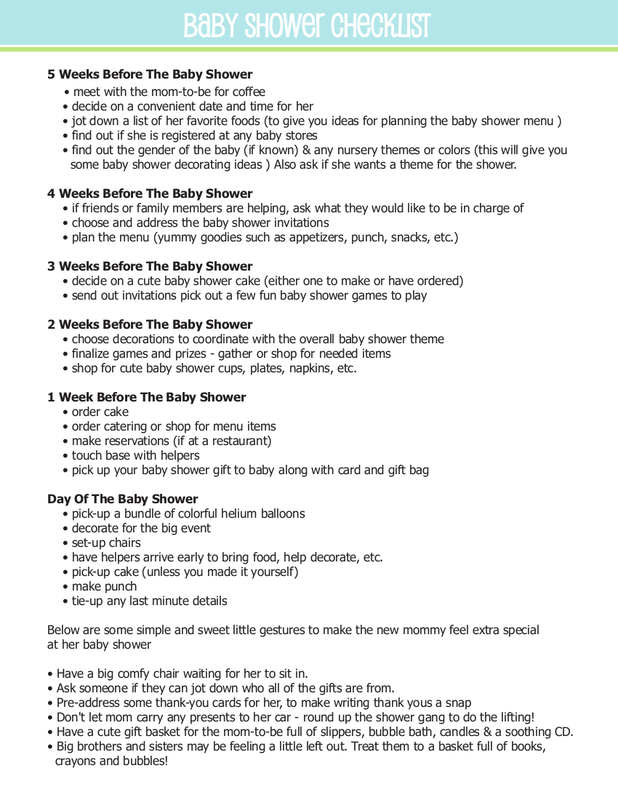 What Should Be Included in Your Baby Shower Checklist? 1. Set the final date of the baby shower. Chances are, your guests would ask when the final date is for your shower that is why, even if you don’t have an exact date yet, set at least a week where the baby shower day would possibly fall in. 2. Guest and contact information list. Your checklist must include the list of guests and their respective information like contact numbers. should also include a list of the potential guests as well as their contact information. 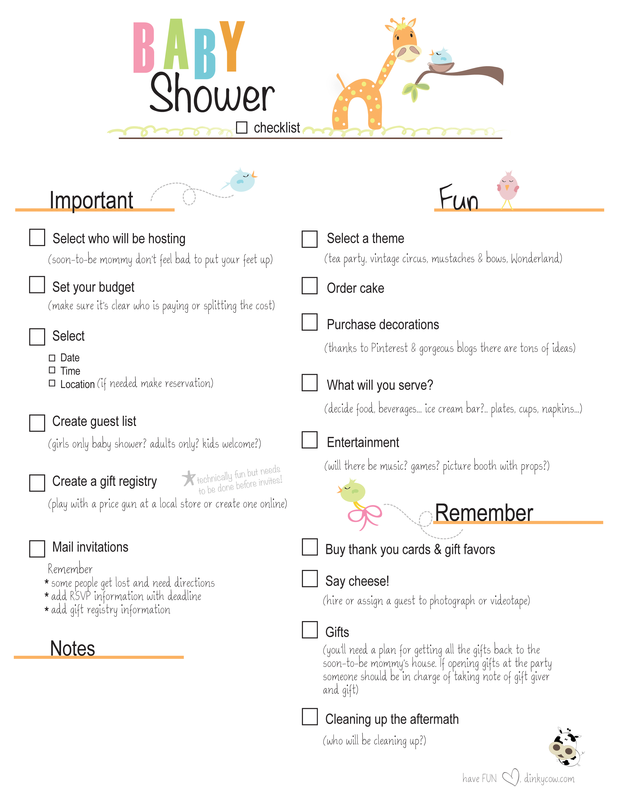 This way you can use the checklist in pdf list to keep track of not only who has been invited, but who is actually attending the shower. 3. Decide and finalize the theme. The theme will be the basis of every decision in the planning stage so make sure this is finalized before the food, the venue, and the line up of activities will be discussed. 4. Decide and finalize the venue. Some people would want to plan this later on but it’s completely different when you would plan for the venue in advance. If you are planning to rent a conference room, you should put in mind that you are not the only person who is going to have an event for a day that is why you have to book a reservation in advance. Even if you are only planning to have it in the comfort of your home, you would still have to plan how you would map things out, what furniture are you going to put out as well as in. 5. Send invitations. It could be the traditional kind of invitation that is printed and enclosed in an envelope. But nowadays, it’s digitalized that you can send it via any kind of social media messenger or e-mail. 1. Food. What celebration does not have something to eat? The kinds of food that should be eaten during the baby shower will depend on what kind of party are you going to have. If it’s going to be a tea party, then make sure that you have already booked an advanced order from you local bakeshop or cafe for cakes and various kinds of pastries as well as contact a supplier of tea or you can already buy boxes of tea bags at your local store. If it’s a pajama kind of party then prepare all the junk foods but since it’s rather unhealthy, you could go as simple as having cookies and milk. There are also sophisticated kinds of parties like having food from high-end restaurants so make sure you have already gone to the restaurant you are planning to order your dishes from. And there are also some baby shower parties that comes in the form of a picnic, so make sure you have already identified the kind of juice you are going to drink for the party or identify the kind of finger foods that you are going to serve your guests during the party. The food would always depend on o the theme and the kind of party you are planning to have as long as you make sure that the guest that would be attending are going to eat it. 2. Decorations. Some people would take for granted this par baby shower decorations can vary depending on the venue and the baby shower theme. A cute banner or garland goes a long way, but don’t forget to accessorize it with plenty of balloons, paper poms, or lanterns. Hang your main decorations where most of the activity will take place (for instance, where the gifts will be opened) so that it makes a good backdrop for the pictures. Get some table settings that match the colors and set out some pretty flowers to add a special touch. Games. Any event would not be enjoyable without games and the silly ones are the best. Planning the games beforehand, instead of planning it on the day of the baby shower, would give you time to prepare for the necessary game props that will be used. Performances. Although not necessary, having performances from the guests will spice up the event. There could be some singing and dancing and all other sorts of performances. Performances from the would-be parents would be exciting and fun as well. Talk time. This is when pieces of advice from “veteran” mothers would come in. This is the highlight of the event in which the would-be mother would be able to have some tips and even tricks of parenting and child-rearing that would come directly from women who have been mothers for a very long time. Gift-giving. Despite the perception of baby showers being used as a way of begging gifts, there are still people who would gladly help the would-be parents especially with the things that the baby will use. We all know that the things and items babies need, despite being small, can be expensive. Giving gifts can be a way of appreciating and celebrating the blessing that is to come or that is already happening.